Why should you go camping? Hiking is an adventure no matter what kind of terrain you are going to do it in. If you are mountain hiking, then you might find the adventure even more exciting. But his will only be the case if you are well prepared for it. It is nice to do things spontaneously, but mountain hiking is not one of them. You want to be well prepared, and make sure you plan your route as well as your entire trip. When you know your route, you will have a good idea of what to expect, and you will know what to wear, or pack if it is more than a day trip. Even though you are hiking, you still need to be prepared for weather changes. Be sure to check the weather just before you start out, and also keep in mind the altitude that you will be at. The higher the altitude, the cooler it will be. 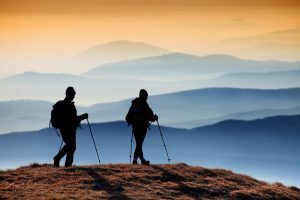 Most experts suggest that clothes for hiking should be made of synthetic materials. Even with your mountain hiking you will sweat, and this type of clothing will keep your dryer and more comfortable. Materials that are light and soft are the best choices. While it might be nice and warm at ground level, once you start up the mountain it will get a lot cooler. For this reason you are going to want to wear pants. As with any form of hiking, your footwear is going to be critically important. Wool is often what many seasoned mountain hikers choose. Your boots are something that you should be prepared to invest in. If they don’t fit right, you can bet that before long you will wish you were off the mountain. In addition to this, raingear, even if it’s a bright sunny day, is something you are going to want to have with you. The mountain weather can change within seconds.